When shopping for a new home, some people want to squeeze extra value out of their dollars by attempting to buy a distressed property at a discount. This typically means they're looking for a home that's been foreclosed on by the bank because the owner had financial issues. There are several ways to locate these properties and several things you'll want to know about finding the right agent to help you. Before thinking about buying a distressed property, it also helps to learn a little bit about how homes end up in this state and how you can work with the banks to find and purchase one. Banks own real estate because they have acquired the homes through foreclosure. Homes on a bank's books are called REOs, which is an acronym for "real estate owned." When banks receive the property deeds to homes through the foreclosure process, it's often because no one showed up on the courthouse steps to bid the minimum amount of the existing mortgage(s) or the bank purposely started the minimum bid so high that nobody would touch it. Why Buy an REO or Foreclosure Property? If two loans were secured to the property (which is common these days), the second lender sometimes does not foreclose. 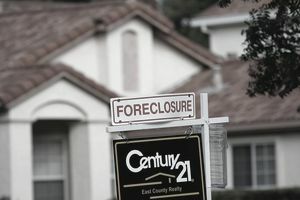 If the second lender does not make up the back payments to the first lender and commence its own foreclosure proceedings, the second lender gets wiped out in the foreclosure. Many second mortgages comprise 20 percent or more of a property's original market value. The bank often does not want to sit on its inventory. Since it did not receive its minimum bid from an investor or home buyer during the foreclosure sale at the courthouse, there's a decent chance that the bank might price that REO home for a significant discount, just to get rid of it. This may depend on its internal accounting and how many homes it already has on its books. There are many places available online to find foreclosures. One of the best places to find them is on a Multiple Listing Service (MLS). If you ask your buyer's agent to search the MLS for "REOs," you will probably find that a small group of real estate agents specialize in listing REOs for sale in your neighborhood. Most REO listing agents list only REOs, no other type of property. REO listing agents often give discounts to the banks in return for their business, because these agents deal in volume and sometimes the bank's asset manager gets some of the commission. REO listing agents make money by either selling a lot of REOs or operating as a dual agent. Under dual agency, the REO listing agent will earn both the listing commission and the buyer's agent's commission. To attract buyer's agents, many banks offer a larger percentage of the commission to the buyer's agent while discounting the listing agent's commission. REO listing agents generally represent the seller, not the buyer. Consider whether you want your own representation to serve as your advocate. REO listing agents are typically top-producing agents because of the volume of business they conduct. They typically do not spend a lot of time working with buyers and will probably not engage in much hand-holding. Some REO listing agents are so busy that they hire assistants to field calls. Many do not give out their private cell phone number, which can make communication difficult. Unless you have direct experience negotiating with banks, you may receive better representation by hiring your own buyer's agent. Before you select an agent, choose several and interview the real estate agents to find a good fit. Buyer's agents have a fiduciary responsibility to protect your interests. Buyer's agents do not represent the seller, even when the seller is paying their commission. Buyer's agents are generally paid by the seller. This means it does not cost you to hire a buyer's agent. Buyer's agents may ask you to sign a buyer's broker agreement, which will lay out the agent's duties to you and specify who pays the commission. Consider working with a buyer's agent who has experience working with REOs. Once you've located some listings of interest and found yourself a buyer's agent, you're ready to move to the next step, which is contacting the bank. You will likely be asked to buy the home "as is." There are drawbacks to buying foreclosures, and you must make your offer subject to a home inspection. Some sellers in default will damage homes in foreclosure or strip assets such as kitchen or bathroom appliances. The bank may ask for you to submit a loan application so it can prequalify you; however, you are not obligated to obtain your loan from that bank. You might be kept waiting 10 days for a response to your offer from the bank. Be patient. It seems crazy that some banks can take a long time to respond, but they can. If the bank won't budge and you receive an offer rejection, wait another 30 days and then resubmit your original offer, with the original date crossed off and your new date inserted. If you cannot close by the predetermined closing date, the bank may charge you a penalty for each day you pass that date. Make sure you have a loan preapproval letter from your own lender before submitting an offer and get assurance that you will receive the financing from your lender without running into unexpected delays. Beware that you may run into unexpected fees during the transaction. Take note that the bank may also run the transaction differently than you would experience in a non-foreclosure home purchase. Banks negotiate bulk-rate discounts with title and escrow companies. If you elect to use the bank's title/escrow company, check the fees those companies will charge you. Generally, fees not paid by the bank but paid by the buyer will be higher because title and escrow often make up those discounts by charging buyers more. Many banks are moving away from paying typical closing costs for the buyer. Some fees such as transfer taxes, county and state fees, are borne by the buyer and not the bank. Banks do not often pay for pest reports, repairs or home warranty plans. Expect the bank to draw its own purchase contract or addendum to your standard purchase contract. Read it thoroughly and ask a real estate lawyer for advice if you do not understand it. You can bet the bank's lawyer drew up that contract, and it's not likely in your favor. Some banks will not sign a counter offer until all terms are mutually agreed upon between the parties verbally. Is It a Huge Hassle to Buy a House From a Bank? Is It Still Possible to Find Cheap Foreclosures?